Netherland-based Burg that makes wrist watch mobile phones today announced expansion of its business in India by opening two branded stores in Delhi. "We have plans to first establish our business in North India and after 9 months expand our presence in South India. The two stores we added today are part of business roadmap. We will open fifth store in Gurgaon," Burg Global Sales Director Koen Pieters told reporters here. The company already has two store in India -- in Guwahati and Kolkata. Burg manufactures wrist watches which integrate features of a mobile. These devices are priced between Rs 9,000 to Rs 23,000. While the lowest priced model can be used only for making and receiving calls, the high end models have most features of a multimedia mobile phone. The mid-range of the phone starts from Rs 12,000. "All the phones have bluetooth connectivity and users can talk using using bluetooth headset. These phones have AGPS technology with which we can track phone location on internet," Pieters said. He said to track location of a watch phone, Burg's server sends out message to the phone which cannot be seen. "The watch phone responds to the message and based on the time in which the server gets response, the location of user is ascertained," he added. 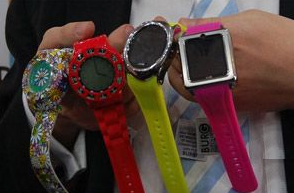 Burg plans to add health and fitness monitoring technology in the watch by January 2013. The company is also looking to integrate Near Field Communication technology that can be used for transmitting data wirelessly like done in case of paying toll charges and metro rail fares using smartcard.